Working with a property owner who insists on an unconventional approach to a project can be a challenge. But it definitely helps, reports William Drakeley, when that client is also open-minded, imaginative and absolutely set on achieving brilliant, gem-like results. It happens only rarely, but every once in a while you run into a client who wants to do things out of sequence. Most often, we’re asked to work on projects where there’s an existing home that needs a watershape. Just as commonly, we’re brought in when a home is being built at the same time as a new pool and its associated environment. In the case described in this article, however, our client owned a 20-acre site with little more than a modest, existing farmhouse on the property. While he planned to replace that structure eventually, he told us, his teen-aged children meant that the fun parts needed to come first. 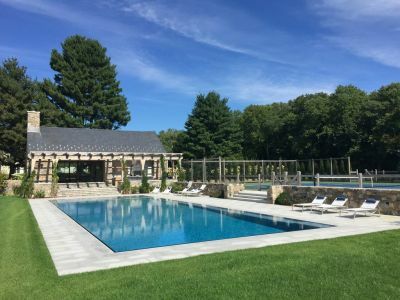 We couldn’t argue with his logic, so we signed on to build a pool, a spa and the surrounding decking, while the adjacent tennis court and pool house were to be handled by other contractors. 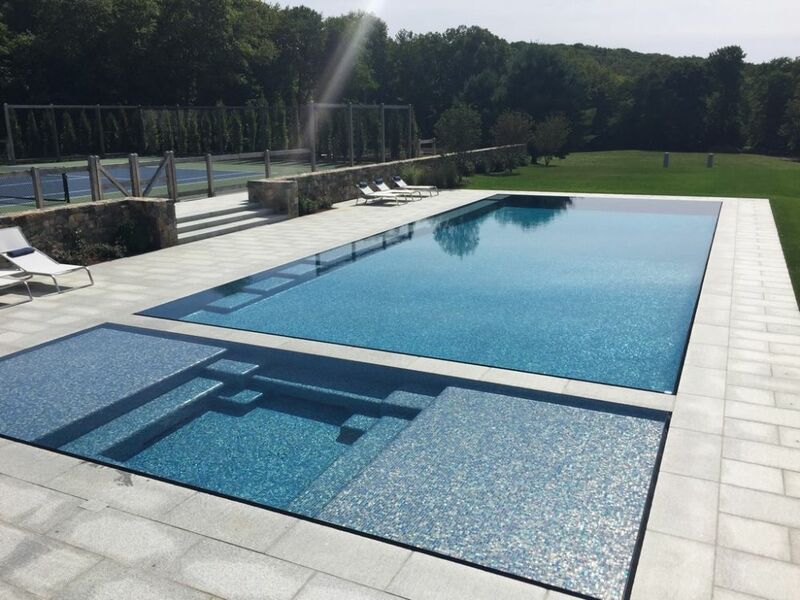 Our work on the property, located in the wooded hills of Roxbury, Conn., actually started several years before the pool project came into focus. 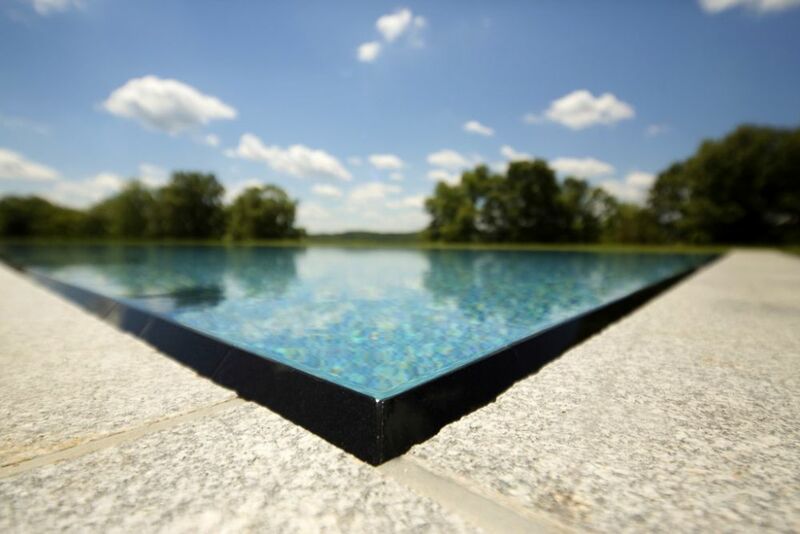 Back in 2006, we at Drakeley Pool Co. (Bethlehem, Conn.) were contracted to build a meditation pool to memorialize the client’s late wife. The waterfeature was situated in a garden area where the two had been married and included an antique olive press. This was our introduction to both the client and the setting. His architect had sought us out based on our skills in concrete construction and our reputation for building unique waterfeatures throughout the region. It was a straightforward job, but it required a tremendous amount of sensitivity and creativity. Our thoughtfulness on this project led the client to contact us when the discussion turned to the pool and spa. When that time finally came, however, we were working in somewhat of a vacuum: There was a place on the plan for a house, but there were no fixed reference points when it came to scope and scale to guide us. As is mentioned in the accompanying text, our first project on the property was constructing a fountain the client – a widower with two teen-aged boys – wanted to establish as a memorial to his beloved wife, who had passed away some years earlier. She had worked in and loved the property’s garden area, which had been the setting for the couple’s nuptials years earlier and was the obvious choice for placement of the memorial. The client was very clear about what he wanted: an antique stone olive press set in a basin with water flowing over a millstone core. With the certainty of his vision driving our work, the task was a simple pleasure. More important, we impressed the client and his architect with the trouble-free quality of our work – a fact that led to far greater involvement with the property later on. What we did have, fortunately, was the certainty of the adjacent tennis court – so we used its size and proportions to trigger our thinking. As graduates of the Genesis schools and members of the Society of Watershape Designers, we had the skills required to draw up preliminary ideas for a side-by-side pool/spa composition, linking its features into the lines established on the paved surface just one level above our working space. Both pool and spa featured knife-edge-slot, perimeter-overflow designs that gave them the appearance of floating above the surrounding deck. The watershapes and tennis court are not exact counterparts – at 25 by 80 feet overall, the pool/spa footprint isn’t regulation tennis court size – but there is nonetheless a strong sense of visual balance. To articulate the connection, we aligned the pool’s top step with the steps leading down from the court, tying the two levels together whether you’re looking up from the pool deck or down from the court. But even though the client was quite imaginative and creative, he wanted more detail than our sketches showed. So, equipped with our plans and photographs of the property, we worked with Skip Phillips and Greg Boruff at Questar Pools & Spas (Escondido, Calif.) to generate a computer-assisted, three-dimensional presentation package. The client was thrilled with the three-D renderings, commenting that what he was seeing was just what he always wanted. He then began describing the watershapes as the “jewels of the property,” using a word that would take on unusual significance as the project progressed. We started our work in earnest, excavating the site and encountering the usual run of small fieldstones as well as moisture-retaining cohesive clay soil that leads to significant freeze/thaw pressures. Not wanting to take any chances of the decks heaving, we installed a sub-deck/sub-pool dewatering system that is open 365 days a year to an outlet pipe located downslope from the pool. We then set about forming the spa and its unusual pair of thermal ledges alongside the pool and established everything required for the two vessels’ perimeter overflows. The pool and spa were to have entirely separate plumbing systems – separate surge tanks, separate circulation systems, separate everything – but what they did have in common was a narrow wall that marked the divide between them. For design purposes, that wall had to be thin: no more than the width of the coping system we were using. This had consequences: We knew that if we tried to insert our customary slot-drain piping for both vessels into such a narrow wall, the shotcrete coverage of the two pipes would have violated the basic American Concrete Institute (ACI) coverage standard and would have been so minimal that our annual freeze/thaw cycles would eventually end up shattering the wall. The pool and spa cover a lot of ground – nearly the size of a regulation tennis court – which meant using a massive amount of steel and pipe (top left and middle left) and keeping track of a large number of lines as they moved toward and into the equipment vault/surge tank bunker (middle right). Construction also included a couple cool details, including toe-kick recesses for the pool and spa circulation systems (right) and the special slot-drainage system we built into the narrow wall dividing the pool and spa (bottom left). Instead, we set the wall up as a monolithic structural concrete wall and cut out channels on both sides before it fully cured. 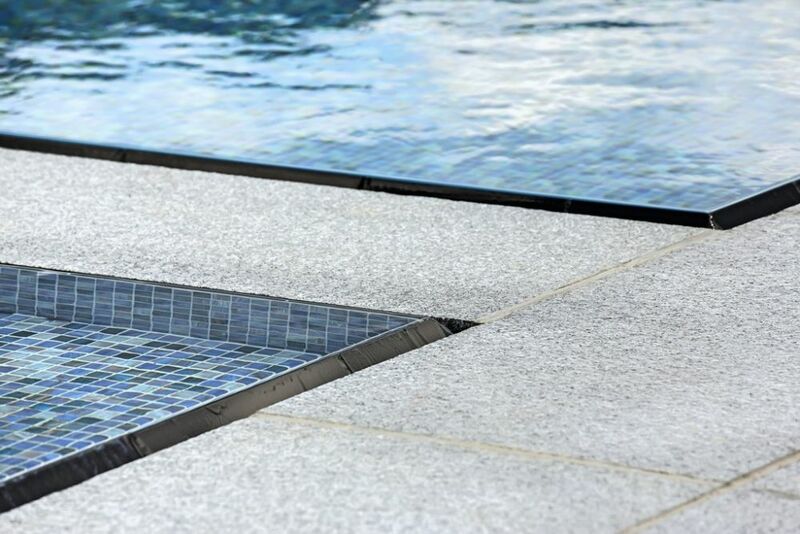 On the pool side, the slot empties into several dropouts; on the spa side, we cut the slot with a slight rise in the middle so gravity will lead water to the sides of the spa and their drainage pipes. While it was a lot of work, it was the right engineering solution for this particular detail and the very specific look we wanted. 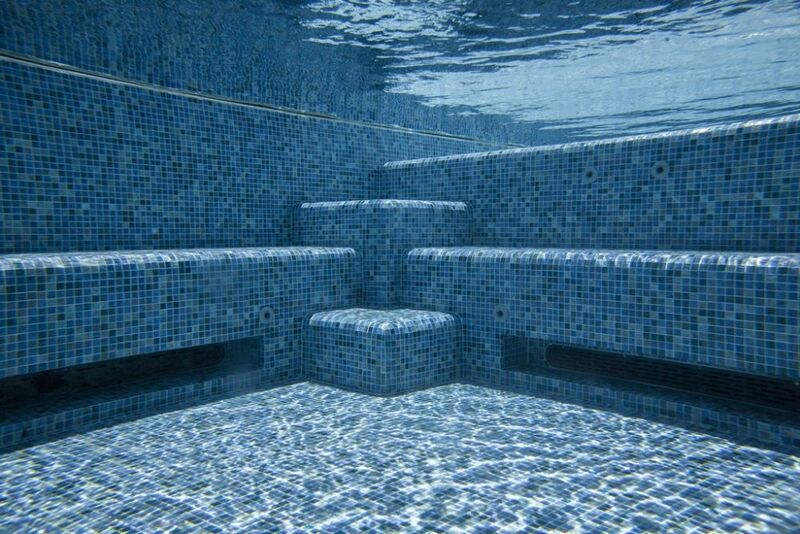 The original design featured glass tile applied to the interior of the spa as well as the tops of the pool steps. 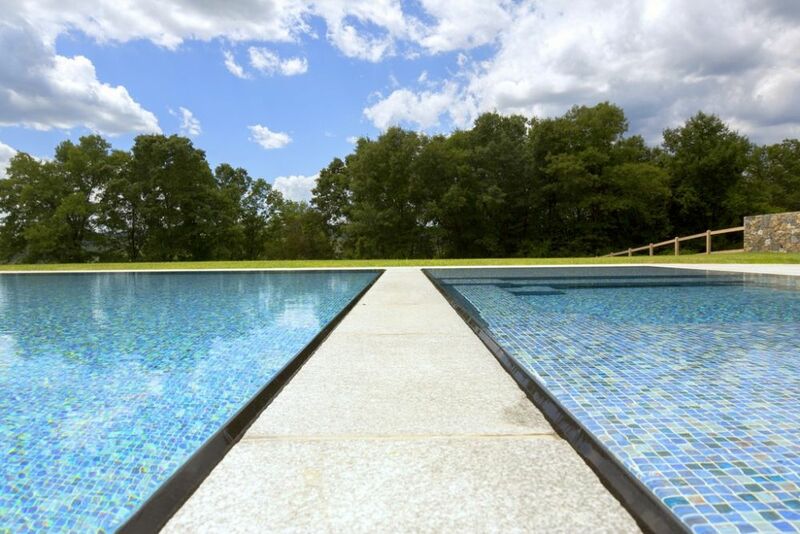 As the project progressed, the client decided to further expand on his “jewel” concept by having us tile the pool from end to end. 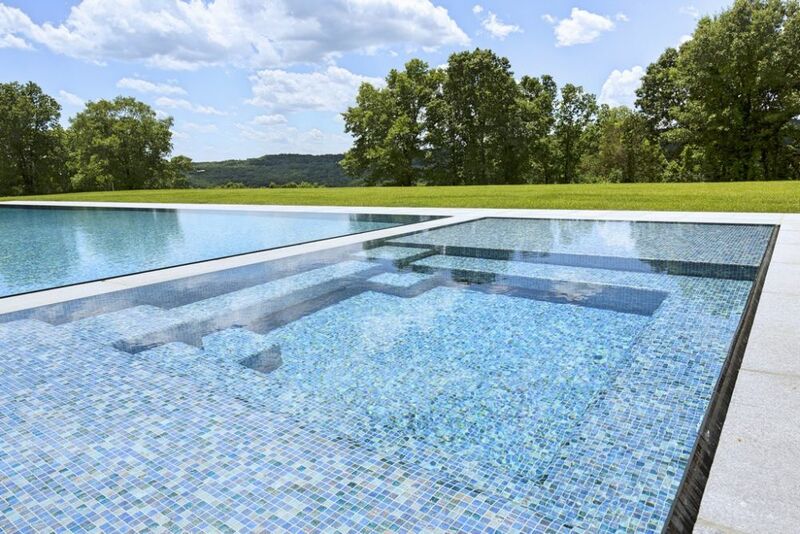 The client had previously selected a custom blue blend of three-quarter-inch glass mosaic tile from Bisazza (Miami, Fla.) for the pool house. Now he wanted us to carry that look throughout both watershapes, creating magnificent, sparking jewels in the middle of the property. Per plan, we’d set the spa up to have an all-glass-tile finish and had made certain the raw concrete surfaces were square, plumb and relatively smooth (left). Later on, the client decided to tile the inside of the pool as well, which left us with plaster-ready coves, floor slopes and rough concrete. So we ended up applying plaster anyway to make the surface suitable for installation of the jewel-like tiles (middle and right). It wasn’t the ideal situation, but we made it work. Since we had been operating under the assumption that the pool would have a plaster finish, we’d created a radiused floor/wall connection and left the concrete in much rougher condition than we would have had we known the pool was to be tiled. By this point, we’d already tested the shotcrete at 6,000 psi and had tank-tested the shell, filling it to verify its watertightness. So now we plastered the inside of the pool to smooth out the imperfections that otherwise would have shown through with a glass-tile finish. 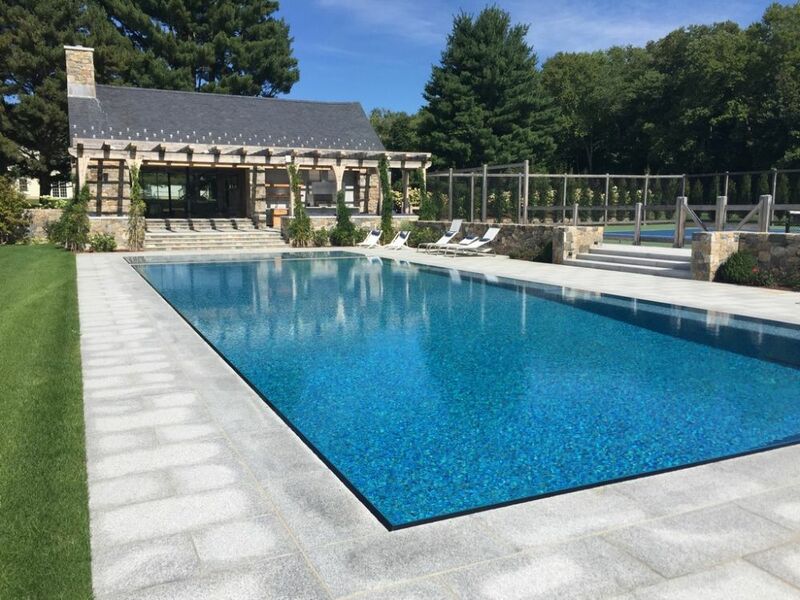 As we continued tile installation, the stonemasons placed the granite decks – a beautiful material honed to give it a slightly rough, slip-resistant texture. 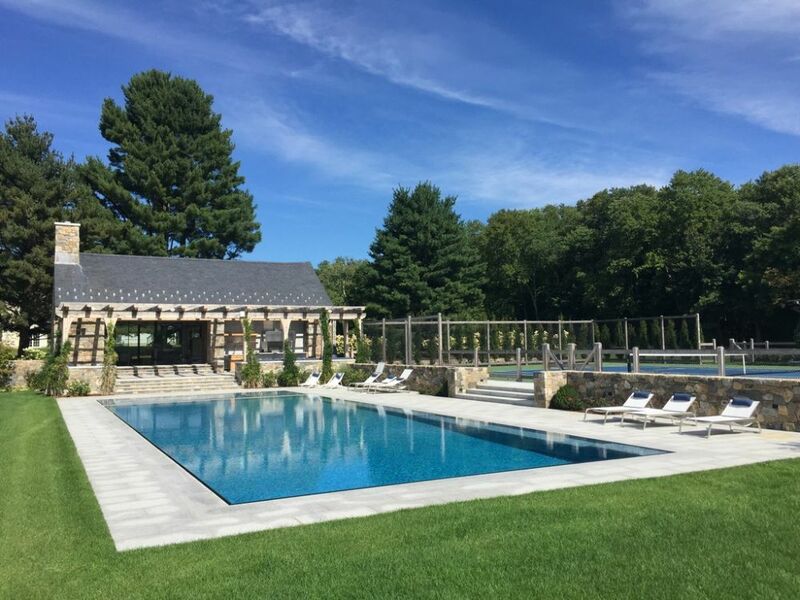 Although the work under our purview went smoothly, we experienced a fair share of communication issues with the general contractor who worked on the pool house. As part of our work, we had set the foundations for the walls and step systems leading up to both the tennis court and the pool house. Without consulting us, the contractor cut away certain portions of that foundation and managed to cut through some of our lines in ways that gave rise to both tension and consternation on site. 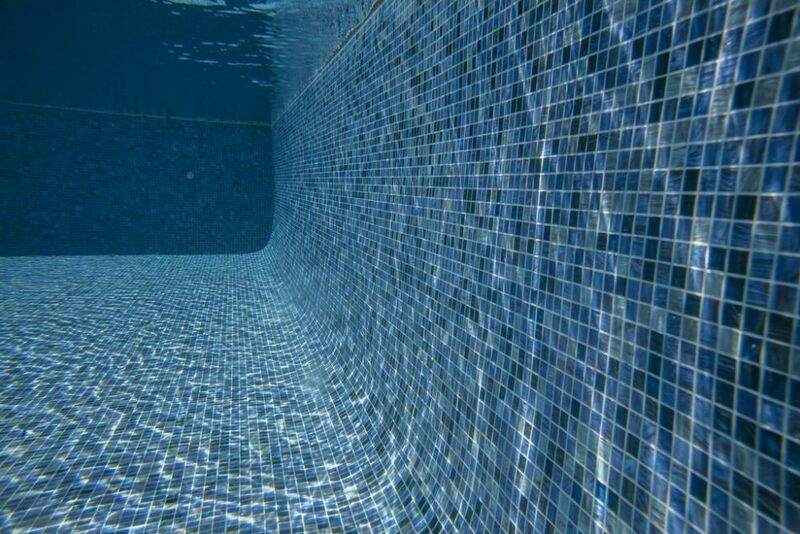 The angled perimeter-overflow pool walls are set at a precise, uniform level just a bit proud of the surrounding deck surface. This takes advantage of the fact that the watershapes will be smoothly sheltered from the winds on three sides once the new house is built: The slight elevation accentuates the jewel-like reflective surfaces that captured the homeowner’s imagination. Those issues were ultimately resolved – and yet another lesson duly learned on the importance of job-site communication across disciplines. We soon completed our work, including the rigging of a downslope building that contains two surge tanks, twinned equipment sets, an equipment-storage room, a generator bunker, and a secure space for the homeowner to use for storage. 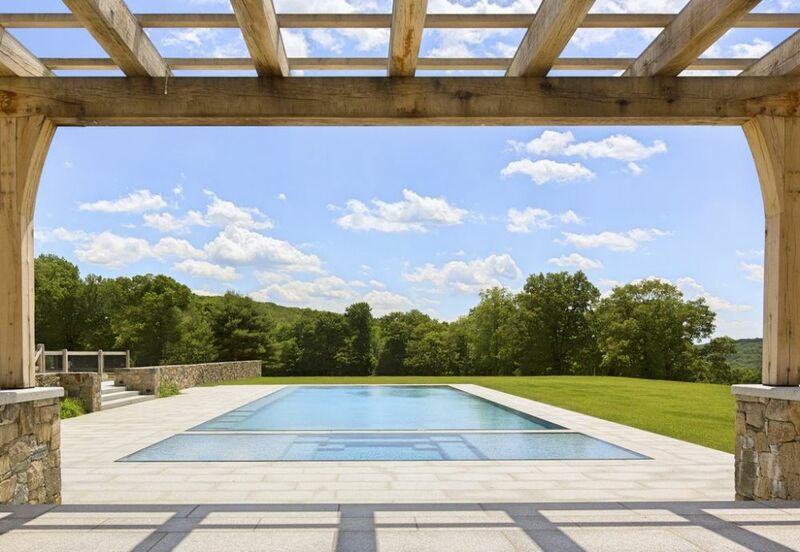 Eventually, a grand home will take shape at the end of the pool opposite the pool house, and the view from the watershapes will shift away from the nearby trees and over to the longer, far lovelier downslope view. Sheltered from the breezes, the watershapes stand a quarter-inch proud of the deck surface, giving them the glassy, reflective, jewel-like appearance that captured the homeowner’s imagination during the design process. From every angle, up close or from some distance, the pool and spa have exactly the ‘jewels of the property’ look the client had envisioned from the start. And it’ll only get better when the new house takes shape in the space framed by the pergola in front of the pool house. While the client’s focus was rightfully on the visual appearance of the final project, as a company we have to balance that sort of aesthetic perspective with the raw practicalities of ensuring the structures are mechanically, hydraulically and structurally sound. The fact that we can do so without sacrificing aesthetics? This is what has earned us our reputation in our region – and in the industry. William Drakeley is principal and owner of Drakeley Industries and Drakeley Pool Company in Bethlehem, Conn. He holds the distinction of being the first and only pool builder to sit as a voting member of the American Concrete Institute’s Committee 506 – Shotcrete and serves as secretary of the ACI C660 Nozzleman Certification Task Group. Drakeley is also an approved examiner for ACI-Certified Nozzlemen on behalf of the American Shotcrete Association (ASA), chairman of the ACI Pool Shotcrete Subcommittee, an ASA technical adviser and deputy director of the Genesis Educational Program. He teaches courses on shotcrete applications at the Genesis Construction School, World of Concrete and numerous other trade shows and is a contributor to Shotcrete Magazine and other industry publications.